Then, last October, it happened. 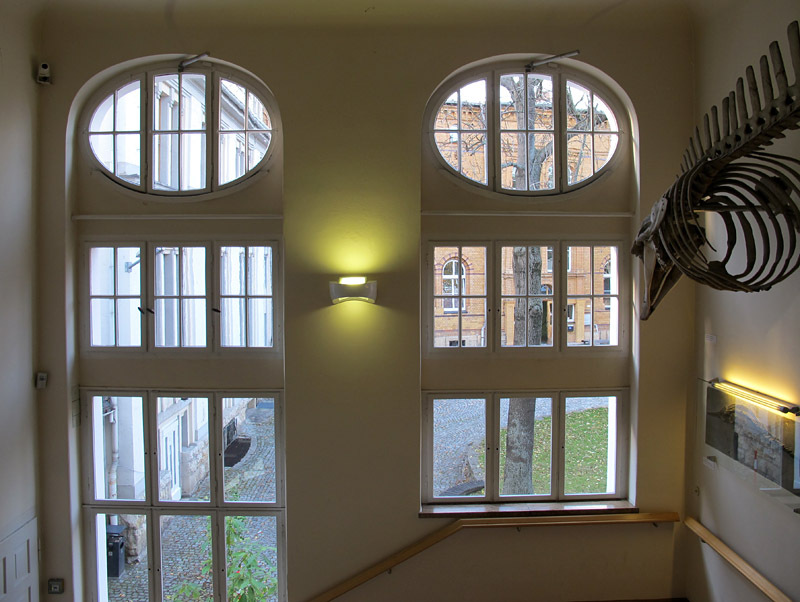 I was visiting Germany to examine collections of fossil jellyfish, driving from place to place with my colleague James Hagadorn. 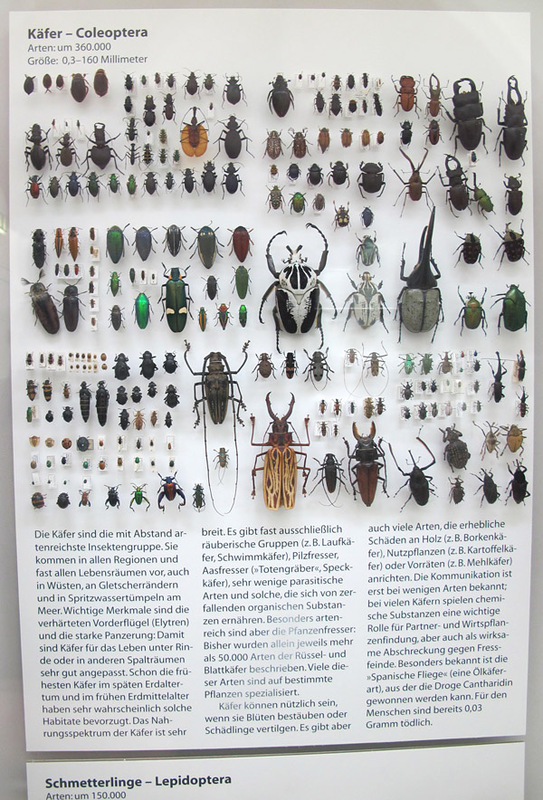 After time in Munich, we were studying collections in Freiberg, a bit north of the Czech border. Freiberg was to be followed up with a visit to Gotha, before we headed for Frankfurt and our return flights to North America. On our second day in Freiberg we finished by lunchtime, which meant that there was time to stop somewhere on our way to Gotha. So . . . Jena! It turned out to be a pretty little city. The museum was easy to find, and there was parking on the street right beside it. 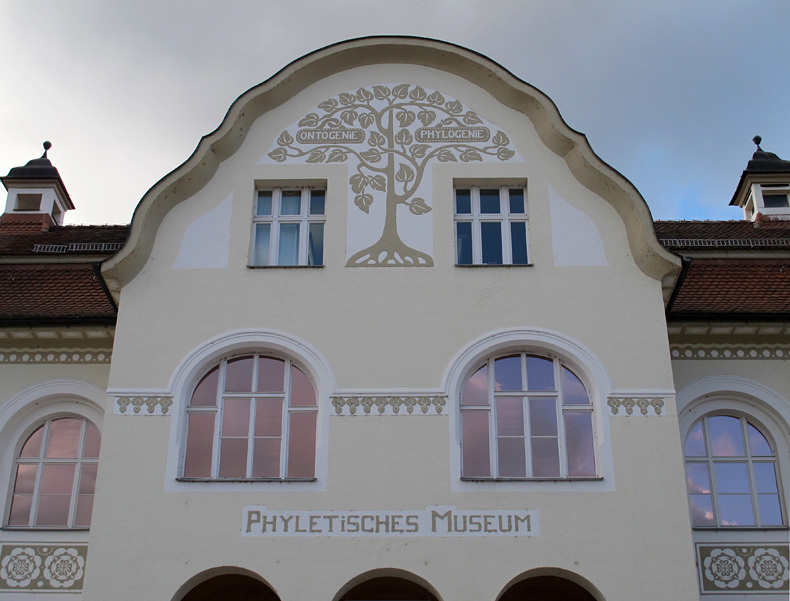 The Phyletisches Museum was actually planned by the great biologist Ernst Haeckel, as a physical representation of some of his ideas on phylogeny (the evolution of groups of organisms) and ontogeny (the development of an individual organism). 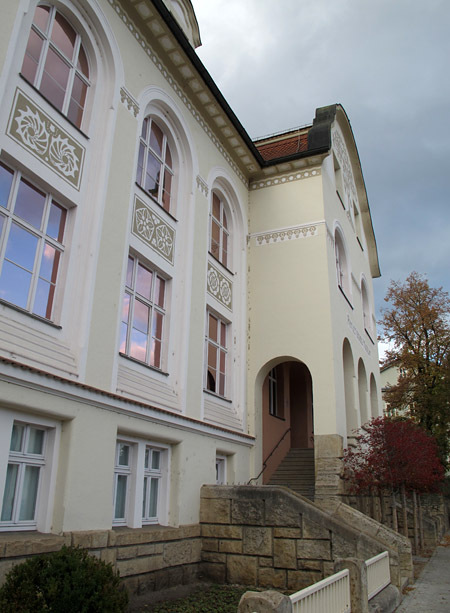 It was opened at the University of Jena just over 100 years ago. 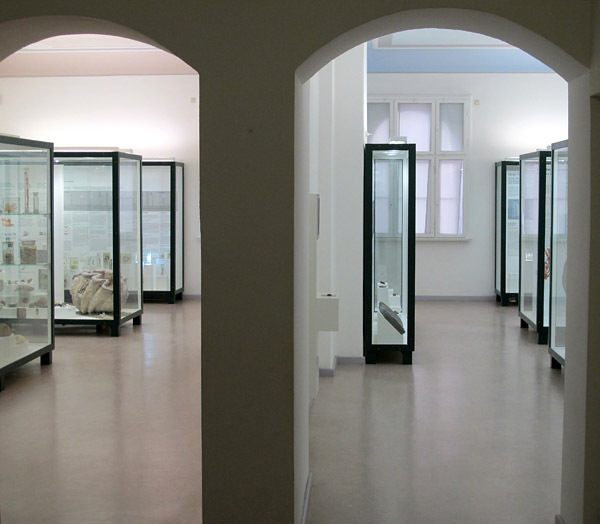 The collections of this museum have a tremendously deep history extending back hundreds of years, but as a university museum of modest size, I suspect that it had some lean times in the mid 20th Century. 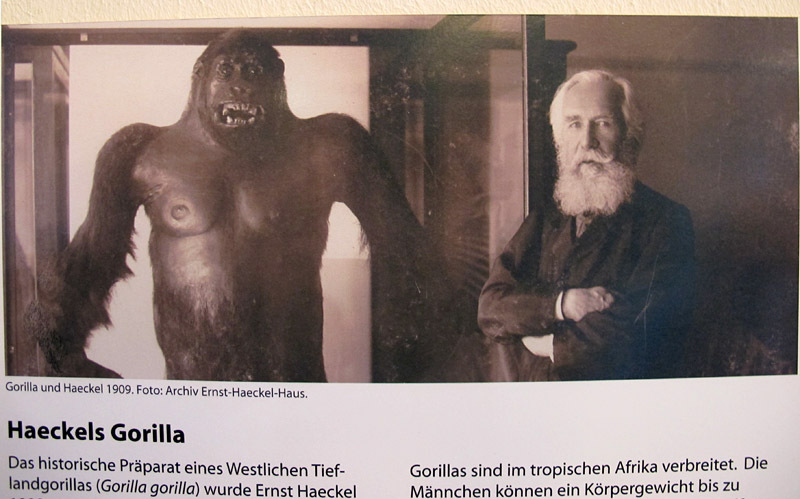 A preserved gorilla with Ernst Haeckel . . .
. . . and in another part of the museum, a gorilla and human have their skeletons and muscles compared. Fortunately, things seem to have improved more recently. 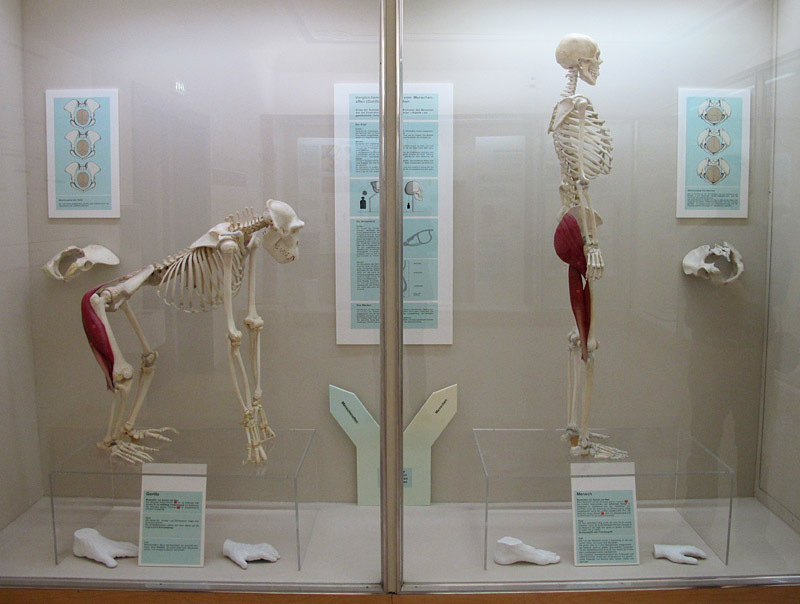 It appears that all of the exhibits have been renovated, with the old cases being cleverly re-used in beautifully designed exhibits that include large numbers of specimens from the collections. 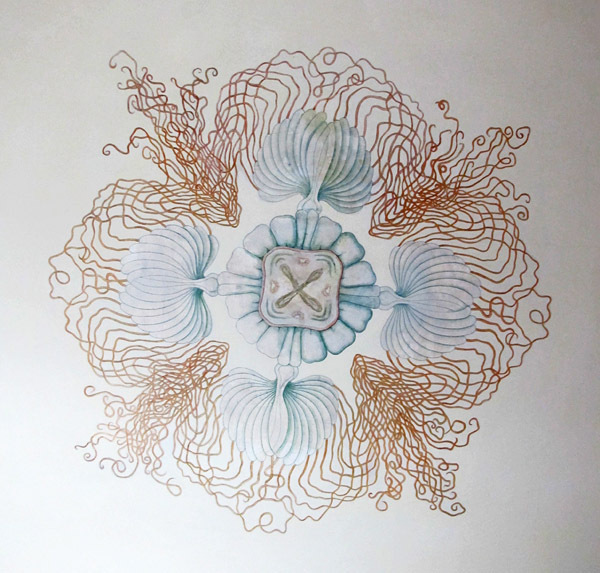 With the gorgeous architectural features of the building, it all “works” as a coherent piece. 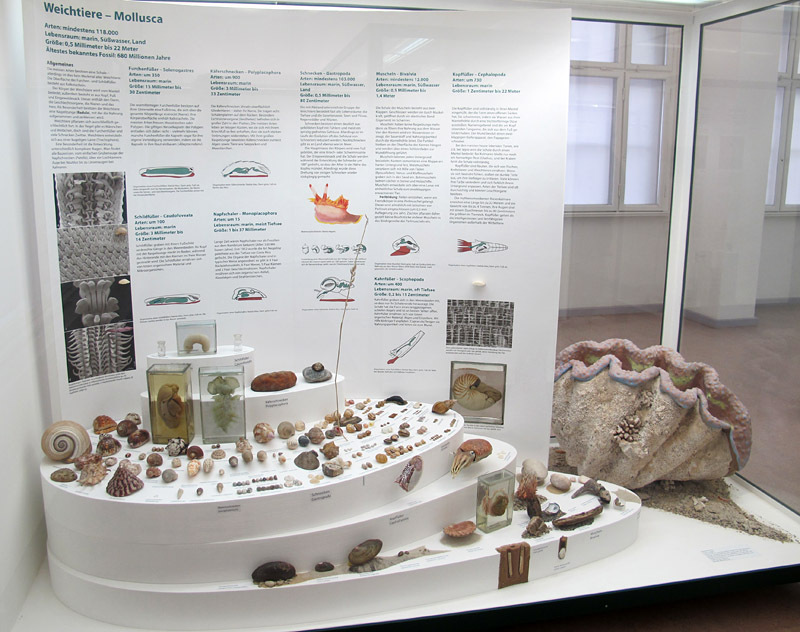 Many of the exhibits feature clever touches, such as the burrows within the plinth of this mollusc case. 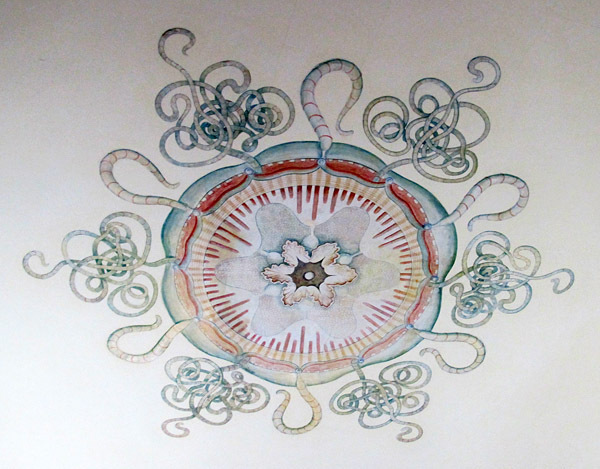 The original exhibits had included the “Medusa Hall”, which featured the paintings of jellyfish based on original designs of Haeckel. One of the “modernizations” of the 1950s had bizarrely included the painting over of this fabulous artwork. 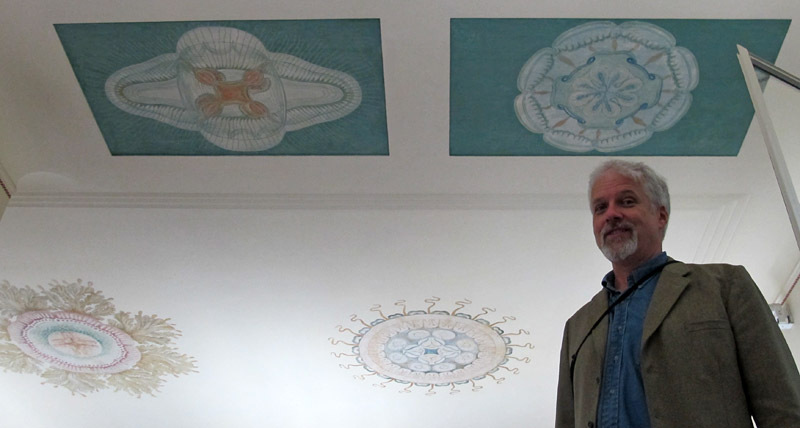 The modern museum administration has been working to reverse these mistakes; the artworks in one room have been restored, and restoration of the ceiling in one of the other halls has apparently begun. 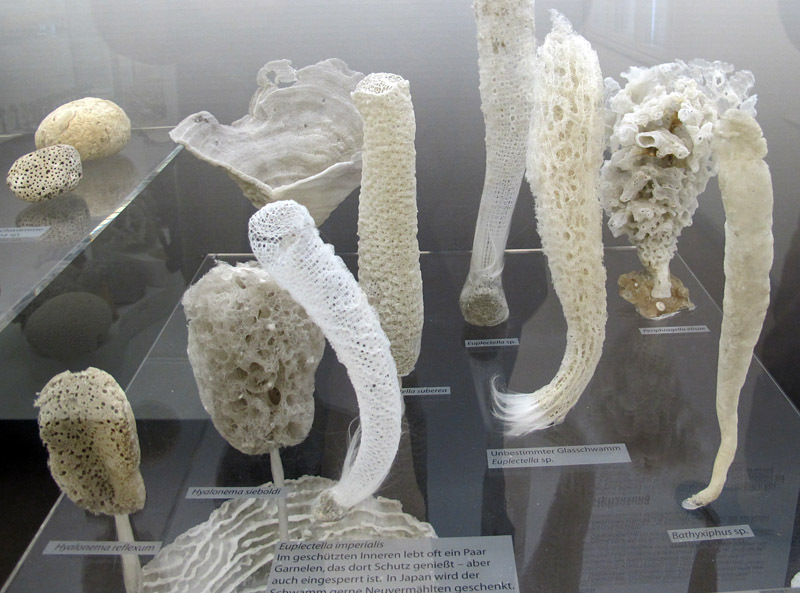 This museum is all just so . . . intelligent! It shows what can be done with intellect and design sense, at apparently modest cost. I applaud the people who have created this place. I express my delight on seeing Medusa Hall (photo by James Hagadorn). 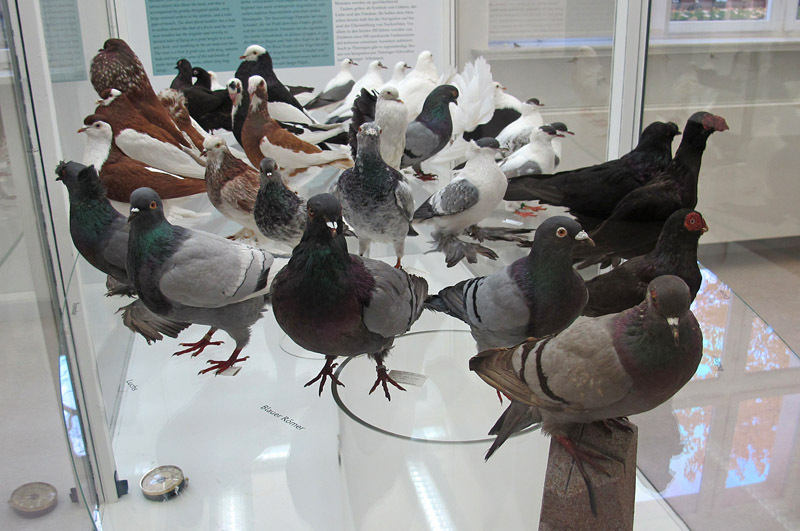 Classic evolutionary examples, such as the variation of pigeons, are featured. 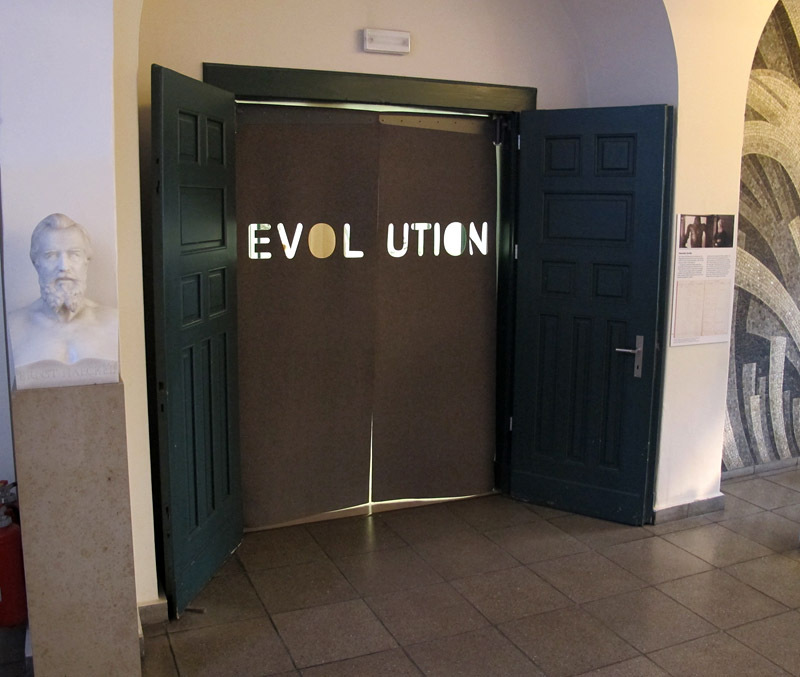 The building was designed to complement the exhibits within it. 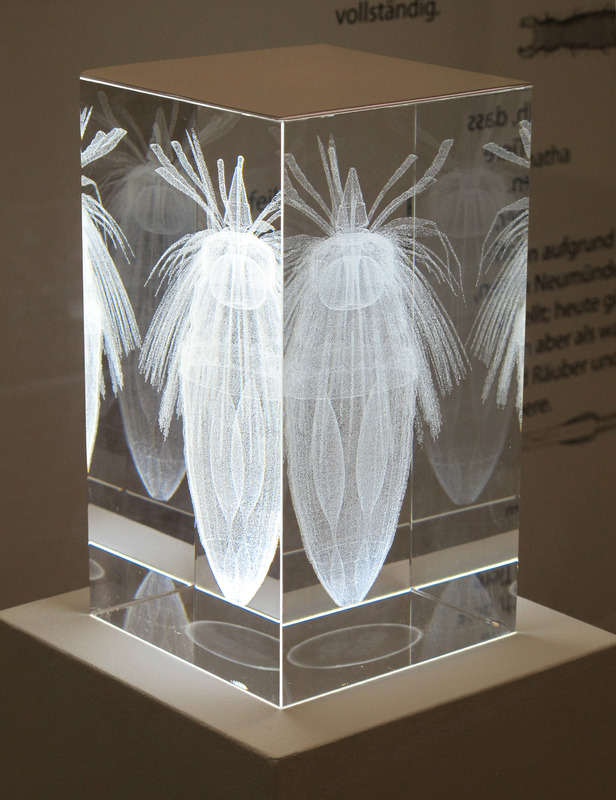 Many of the smaller creatures are illustrated with beautiful SEM images. 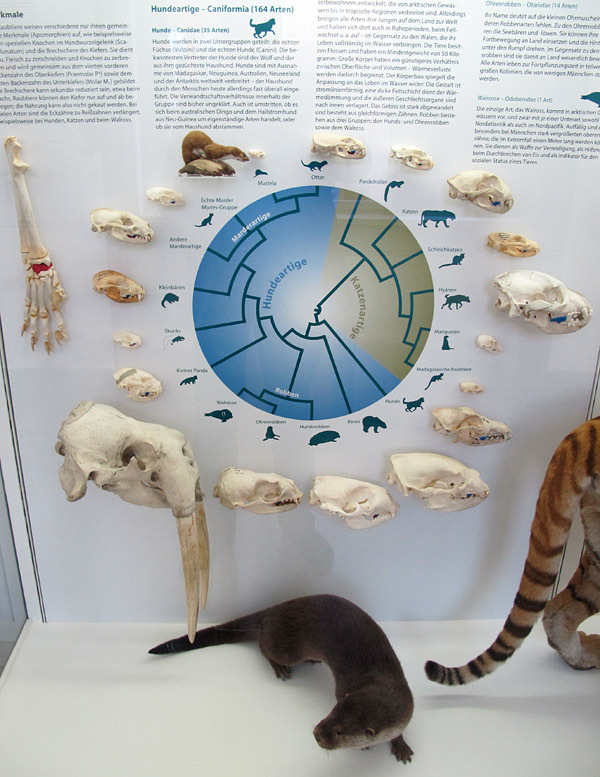 Carnivorous mammal relationships are shown with skulls and other features. 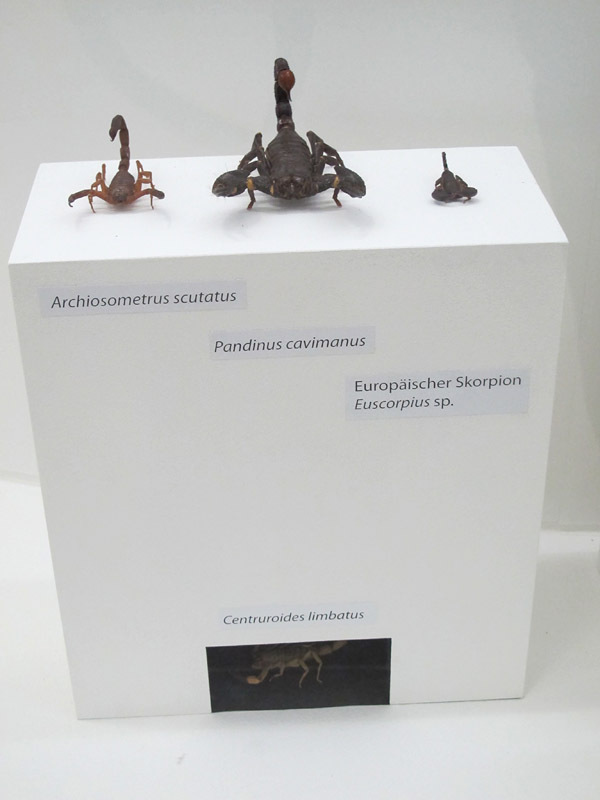 I love the way one of the scorpions is shown “living” in a hole! 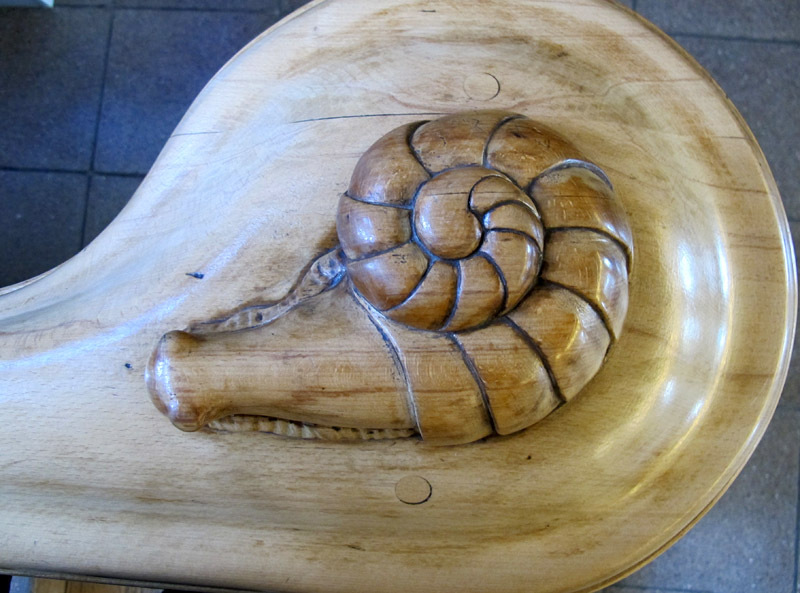 Thank you for this wonderful tour of a beautiful building and its treasures, so well presented. 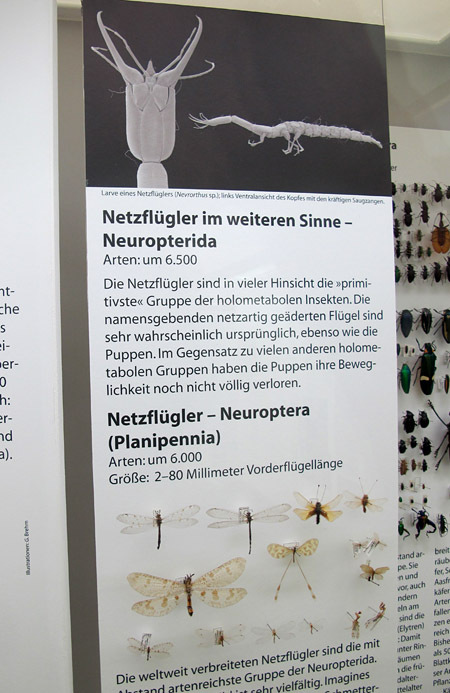 Being a museum professional, I appreciate seeing what other places do with natural history collections. Creative and beautiful displays! Thanks for the vicarious travel. Kate, many thanks for your kind comment. 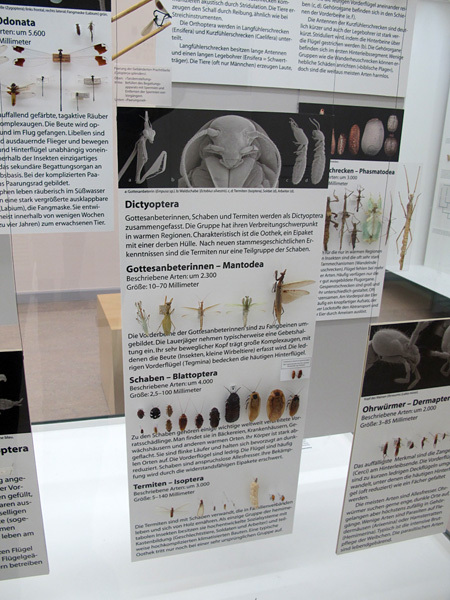 I notice the fact that the displays are not only well presented, but have great depth and detail as well. 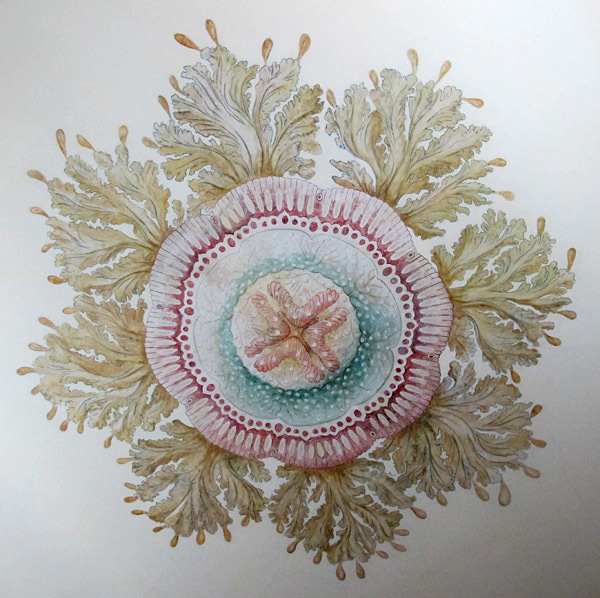 With this kind of variety and scope, they go much further in educating the observer.